Gyeongju, ancient capital of the Unified Shilla Kingdom for a millennium, is perhaps known as the most representative tourist city for foreign visitors in South Korea. Yet, not many people — even South Koreans — are aware that it is one of the most livable cities in the nation. Wiith lots of spacious green parks made mainly out of royal tombs and other historic relics, Gyeongju offers optimum ambiance in a quiet and healthy setting for people who are sick and tired of the hustle and bustle of large cities like Seoul. Designated by UNESCO as one of the world's 10 major cultural relic sites, the entire area of Gyeongju (1,324㎢) is an open-air museum. 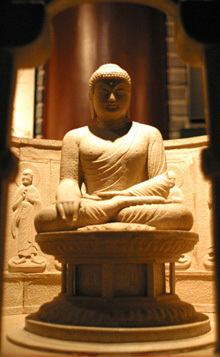 Seokgulam Buddha — Main Buddha's statue at Seokgulam grotto (石窟庵石窟) in Geyongju, North Gyeongsang Province was designated as National Treasure No. 24 in 1962. This grotto was built in 774 by Prime Minister Kim Dae-Seong of Shilla Dynasty. Originally there were 40 Buddhist images carved but only 38 remain today. 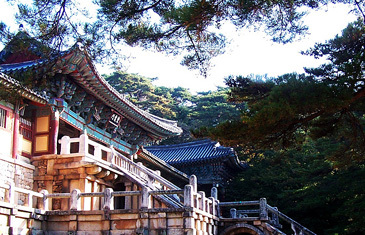 Seokgulam represents the excellence of Buddhist architecture of ancient Korea. There are 31 national treasures amongst its 203 cultural relics. Nearly 10 million tourists visit the tranquil city, which has a population of less than 300,000. Perhaps the best way of touring the ancient Shilla capital is to rent a bike. Gyeongju is a paradise for bikers. It is the only city in the nation that has bike-only roads in all the streets within the city boundary. Gyeongju Station or Gyeongju Bus Terminal is a good starting point for bikers. Bike-only roads start from either of these two terminals will take you to the Bomun Tour Complex along the Bukcheon River. 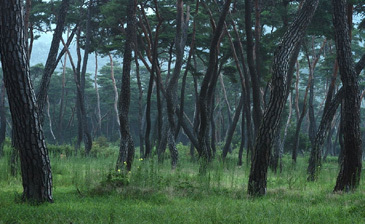 Hyundai Hotel, Concord Hotel, Chosun Hotel are lined up along the picturesque Bomun Lake surrounded by thick forest. Gyeongju is renowned as one of the most beautiful cities in South Korea. The entire city is like a gigantic park with a myriad of well-preserved cultural assets, particularly traditional architecture. The air is unbelievably clean and people live by huge royal tombs. The absence of tall buildings in Gyeongju are so that they harmoniously blend in with the cultural relics scattered around the city. Bikes can be rented from Gyeongju Station and Express Bus Terminal. 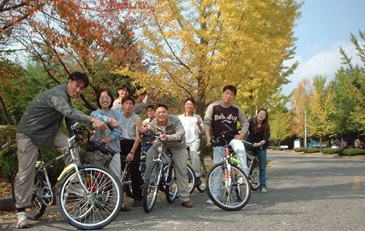 Bike rentals are also available at such major tourist attractions as Grand Wolsung Park, Cheonmachong, and Bomun Tour Complex. Prices for the whole day rent range from 5,000 to 7,000 won. Within Grand Wolsung Park is a vehicle-free street called "Street of Art and Culture," which has been designed as a perfect place for biking. The park is full of all kinds of cultural assets including Cheomsungdae or the ancient observatory, the royal pond of Anapji, and the traditional village school of Hyanggyo. Outside the city are Mt. Seonamsan, and the Hyungsan River. A large tomb of Gen. Kim Yoo-Shin, and Samlung Valley command majestic beauty. In Gyeongju Folk Art Village, traditional handcrafts are made manually. Indisputably, Seokgulam grotto and Bulguksa Temple are the two most famous places in Gyeongju. The temple shows the essence of traditional Buddhist architecture. The already green pastoral city will become even greener and wooded. Gyeongju City's administration recently announced that it would create a "green agricultural village" within its city boundary where farmers practice pro-environment methods of farming such as raising livestock. The city will choose a village with an exceptional natural beauty for the proposed plan of the "green agricultural village." For the environment friendly village the city will spend 1 billion won (some $1 million). The 100-hectare (1,000,000 sq. meter) green village will be completed by 2009. The city will also buy private lands as large as 26,000 sq. meters near Hwangsung Park to build wooded parks in the middle of the city. It will also plant thousands of cherry trees on a site of 24,000 sq. meters around the tomb of Gen. Kim Yoo-Shin in October 2005. Maple trees will be planted in areas around Mt. Toham and Myonghwal Mountain Fortress. A forest will be made on an 110,000 sq. meter site around the Gyeongju Expo Park. Mt. 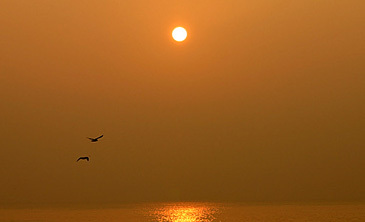 Toham is one of nation's best points for watching the sunrise, which turns the Gampo Sea into a sea of red creating an awe-inspiring moment. 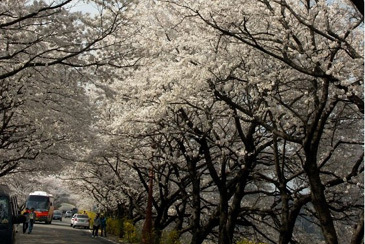 Gampo is only a 30 minute drive from the center of Gyeongju. Gyeongju will also construct even more bike roads including the one along the embankment of Bukcheon River surrounding the city.